Using NASA’s Wide-field Infrared Survey Explorer, astronomers recently discovered a small group of brown dwarfs located less than 30 light years away from the sun. WISE observations also have scientists believing that there are fewer brown dwarfs than previous thought, possibly as low as one brown dwarf for every six stars instead of a one to one ratio. Astronomers are getting to know the neighbors better. Our sun resides within a spiral arm of our Milky Way galaxy about two-thirds of the way out from the center. It lives in a fairly calm, suburb-like area with an average number of stellar residents. Recently, NASA’s Wide-field Infrared Survey Explorer, or WISE, has been turning up a new crowd of stars close to home: the coldest of the brown dwarf family of “failed” stars. Now, just as scientists are “meeting and greeting” the new neighbors, WISE has a surprise in store: are far fewer brown dwarfs around us than predicted. Previous estimates had predicted as many brown dwarfs as typical stars, but the new initial tally from WISE shows just one brown dwarf for every six stars. It’s the cosmic equivalent to finally being able to see down a mysterious, gated block and finding only a few homes. Nonetheless, the observations are providing crucial information about how these exotic worlds form, and hinting at what their population densities might be like in our galaxy and beyond. WISE was launched in 2009 and surveyed the entire sky in infrared light in 2010. One of the mission’s main science goals was to survey the sky for the elusive brown dwarfs. These small bodies start their lives like stars, but lack the bulk required to burn nuclear fuel. With time, they cool and fade, making them difficult to find. Improvements in WISE’s infrared vision over past missions have allowed it to pick up the faint glow of many of these hidden objects. In August 2011, the mission announced the discovery of the coolest brown dwarfs spotted yet, a new class of stars called Y dwarfs. One of the Y dwarfs is less than 80 degrees Fahrenheit (25 degrees Celsius), or about room temperature, making it the coldest star-like body known. Since then, the WISE science team has surveyed the entire landscape around our sun and discovered 200 brown dwarfs, including 13 Y dwarfs. Determining the distances to these objects is a key factor in knowing their population density in our solar neighborhood. After carefully measuring the distance to several of the coldest brown dwarfs via a method called parallax, the scientists were able to estimate the distances to all the new found brown dwarfs. They concluded that about 33 brown dwarfs reside within 26 light-years of sun. 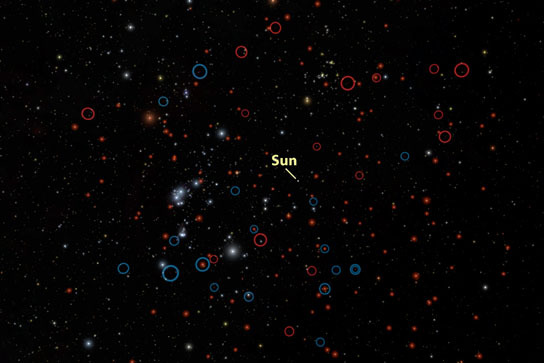 There are 211 stars within this same volume of space, so that means there are about six stars for every brown dwarf. The new observations still allow the possibility of free-floating planets up to a few times the mass of Jupiter beyond a few light-years from the sun, which other surveys have predicted might exist. Those bodies would be too faint for WISE to see in the processed data in hand. The new results are due to appear in the July 10 issue of The Astrophysical Journal. Other authors are: Michael Cushing of the University of Toledo, Ohio; Gregory Mace, Ian McLean and Ned Wright from UCLA; Roger Griffith and Kenneth Marsh of the Infrared Processing and Analysis Center at Caltech; Michael Skrutskie of the University of Virginia, Charlottesville; Peter Eisenhardt and Amy Mainzer of NASA’s Jet Propulsion Laboratory, Pasadena, Calif.; Adam Burgasser of the University of California, San Diego; and Christopher Tinney, Stephen Parker, and Graeme Salter of the University of New South Wales, Australia. 1 Comment on "WISE Observations Provide Crucial Information on Brown Dwarfs"
I have always believe that in any molecular cloud that is a stellar nursery where new stars are formed, there must be small, isolated clumps of gas and dust with it that collapse to form not only small stars like the brown dwarfs but also planets, even rocky planets like Earth. Which brings up a conundrum, will they be a danger to interstellar travel at warp speed since they are so hard to detect. A thorough survey of the solar neighborhood will be needed to allow starships to avoid them.